Young leg-spinner Mayank Markande picked up 4/23 as the reigning champions made a brilliant comeback. Sunrisers Hyderabad held their nerves to edge out Mumbai Indians by one wicket from the last ball of the match in a thrilling Indian Premier League encounter at the Rajiv Gandhi Stadium in Hyderabad on Thursday. Hyderabad’s No 11, Billy Stanlake lofted Ben Cutting’s last delivery of the 20th over to eke out their second win of the tournament. Rohit Sharma’s men slipped to their second defeat in as many matches. Chasing a modest target of 148, Hyderabad were cruising at 73/1 before an inexplicable batting collapse left them staring at defeat. It was young Deepak Hooda’s composed 32 off 25 balls that proved to be precious in the final context of the match. Hooda hit Cutting’s first delivery of the final over for a six to ease the pressure with Stanlake holding fort at the other end. 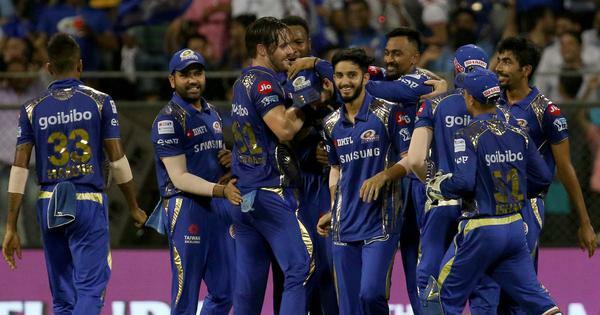 Young leg-spinner Mayank Markande (4/23 in 4 overs) once again impressed one and all with his temperament and control as his spell got Mumbai Indians back in the match despite having a modest total on board. Shikhar Dhawan (45 off 28 balls) and Wriddhiman Saha (22 off 20) made it look like a walk in the park before Markande wreaked havoc. He used his stock ball, the googly, to trap Saha leg before. Skipper Kane Williamson (6) edged one off Mustafizur Rahaman to Ishan Kishan behind the stumps. From a comfortable 73/1, Markande engineered a slide that found Sunrisers reeling at 107/5. Dhawan went trying to hit a slog sweep to a delivery that bounced a tad more. Manish Pandey danced down the track and mistimed his lofted shot while Shakib Al Hasan was played on off the last ball of his spell. Markande currently holds the Purple cap with seven wickets from two games. However young Hooda and the seasoned Yusuf Pathan (14) added 29 runs to bring their team closer to victory. But Mustafzur Rahaman brought them back in contention with a brilliant 19th over that cost Mumbai only a run leaving Hyderabad 11 to win off final over. Thanks to Hooda they achieved it. Earlier, Sunrisers Hyderabad’s bowlers once again put up a stellar show restricting a star-studded Mumbai Indians to 147/8. The much-vaunted Mumbai batting line-up flattered to deceive as the likes of Evin Lewis (29), Suryakumar Yadav (28) and Kieron Pollard (28) got out after getting set, which put brakes on their scoring rate. The lower middle-order caved in badly as Sunrisers looked as potent an attack even without their premier bowler Bhuvneshwar Kumar. Such was the dominance of the Hyderabad bowlers that the last 10 overs of the Mumbai innings fetched them only 69 runs. A lot of credit will got to Rashid Khan, who stifled the scoring during the middle overs with brilliant figures of 1/13 in 4 overs. Rashid bowled flat and fast with a mix of googlies and flippers, earning as many as 18 dot balls. Skipper Rohit Sharma (11) was out trying to whip a delivery from Billy Stanlake (2/42) that had steep bounce and Shakib Al Hasan at square leg took a fine catch. Ishan Kishan’s maverick approach didn’t pay dividends as he failed to make most of a dropped catch by Sandeep Sharma as Siddharth Kaul had him caught at third man. The normally dangerous Evin Lewis (29 from 17 balls) started off well but tried to hit Kaul across the line only to find the off-stump knocked back. The normally dependable Krunal Pandya closed his face to a Shakib Al Hasan (1/34 in 4 overs) delivery to offer a simple catch. Stanlake hurried Pollard into ballooning one to Shikhar Dhawan at sweeper cover. Sandeep then dismissed Suryakumar and Pradeep Sangwan off successive balls to ensure that Mumbai didn’t cross the 150-run mark.